The “narrow edge” in the title of this engaging book by Deborah Cramer evokes the image of comedian Harold Lloyd, in the 1923 film Safety Last!, teetering on a skyscraper ledge, clinging for dear life to the hands of a clock. 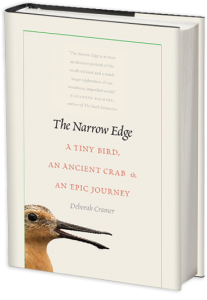 It is an apt metaphor for the uncertain future of the red knot (“a small sandpiper about the size of a robin and weighing about as much as a coffee cup”), which roams the sliver of sand between land and sea, a precarious place to be these days. This indefatigable bird lives for five months on desolate tidal flats at the tip of South America, then, as if possessed, travels 9,500 miles north, following the coasts of two continents, to breed in the Arctic.